Posted on February 23, 2016 by David Tate, Esq. A new California case has held that the ability to recover 2x damages under California Probate Code section 859 does not constitute punitive damages. The case is Hill v. Superior Court (Staggers), California Court of Appeal, First Appellate District, No.A145893, decided February 18, 2016. Without getting into a long legal discussion, why is Hill v. Superior Court (Staggers) important? Claims under California Probate Code sections 850, et seq., have become common and important. In summary, sections 850, et seq., allow certain legal claims in trust, estate (probate), conservatorship and guardian proceedings when money, personal property or real property is claimed to be due to or from an estate or trust. Sections 850, et seq., also may allow the prevailing party who wins on a claim that he or she is entitled to recover the property to recover twice the amount of the value of the property that is recovered. 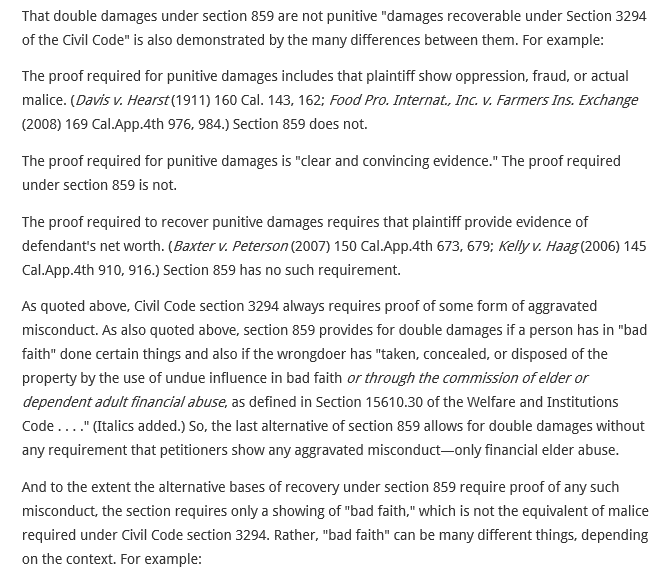 In Hill v. Superior Court (Staggers) the losing party, against whom double damages were awarded, argued that double damages under Probate Code section 859 are in the nature of punitive damages, which would require the prevailing party to prove entitlement to recovery of the double damages under a higher standard (i.e., for example, by having to establish malice, oppression, fraud, etc., before being entitled to the recovery of double damages. The Court of Appeal held that the double damages allowable under section 859 are in the nature of a penalty (upon a showing of bad faith), but are not punitive damages. The result, which is very important in these cases, is that it is easier to recover the section 859 double damages. These provisions need to be carefully considered in all Probate Code section 850, et seq., actions, including for the purpose of settlement and trial as the possibility of an award of double damages can significantly change the dynamics of a case. A claim of recovery under sections 850, et seq., might be possible in a wide variety of trust, estate (probate), conservatorship, guardianship and elder and dependent adult abuse cases. 859. If a court finds that a person has in bad faith wrongfully taken, concealed, or disposed of property belonging to a conservatee, a minor, an elder, a dependent adult, a trust, or the estate of a decedent, or has taken, concealed, or disposed of the property by the use of undue influence in bad faith or through the commission of elder or dependent adult financial abuse, as defined in Section 15610.30 of the Welfare and Institutions Code, the person shall be liable for twice the value of the property recovered by an action under this part. In addition, except as otherwise required by law, including Section 15657.5 of the Welfare and Institutions Code, the person may, in the court’s discretion, be liable for reasonable attorney’s fees and costs. The remedies provided in this section shall be in addition to any other remedies available in law to a person authorized to bring an action pursuant to this part. This entry was posted in will, estate, trust, elder, contest, fiduciary, decedent, intent, disability, conservatorship, elder abuse, elder protection, trustee, beneficiary, executor and tagged elder abuse, estate, probate, trust. Bookmark the permalink.